PONTE VEDRA BEACH – Stellers Gallery at Ponte Vedra Beach will exhibit the work of nationally-recognized painters Erin Gregory and Shawn Meharg with an opening reception on Friday, Oct. 5 from 6 until 9 p.m. at 240 A1A North in Ponte Vedra Beach. The show will feature a new body of work by each of the two artists. As a gallery favorite, Gregory’s focus as an artist emphasizes contrast and variety within the composition of each painting. 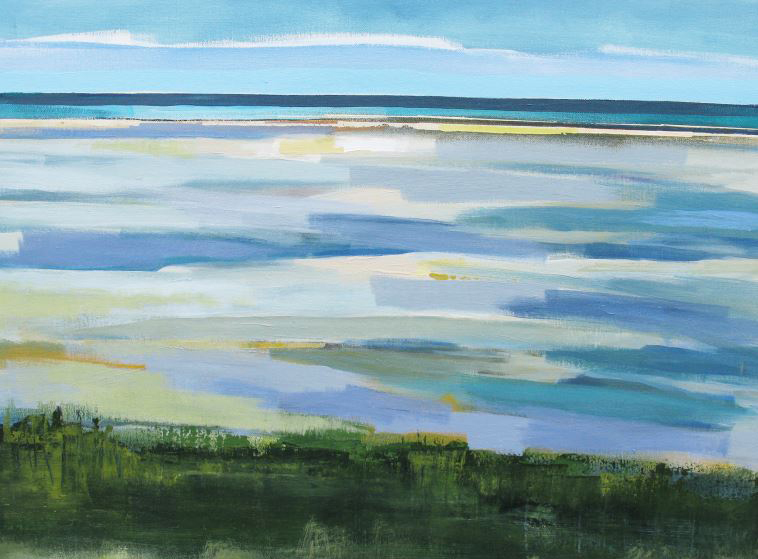 She vividly captures the light and color of her subjects in florals, landscapes, and figures. She paints in acrylic and oil with close-up and distant bold colors, and lively layers and washes. Erin Fitzhugh Gregory, originally from the Mobile and Fairhope, Alabama area, has lived in her husband Tim’s hometown of Columbus, Georgia since 2002. She has been fascinated by art as far back as she can remember. As a child, art was always the highlight of the school day. Upon graduating from Auburn University with a BFA in painting in 2000, and after her first solo show in 2001, she realized painting would be her full-time career. Throughout Gregory’s career, she has had numerous one-woman shows and participates in many group exhibitions. Gregory has received numerous awards for her art and has been featured on many blogs and in a variety of magazines. Meharg has been showing at Stellers Gallery since beginning his fine art career. As another gallery favorite, his work focuses on the making of art which aids him in recalling forgotten moments of his past. The traces of time represented in the paintings are often occurrences or interactions with people or nature as formative snapshots in an elaborate sequence of events, leading to the present. It is his hope that the viewer will become compelled to explore and illuminate the colors and compositions in the artwork and reflect on their own personal history. Shawn Meharg was born in Southern Ontario in 1967, worked as a theatrical scenic artist and designer throughout many branches of the entertainment industry and began his journey as an artist in 2001. His work shows a diversity of style and subject, all involving the reflection and absorption of light. By subtle changes in context or the physical characteristics of an otherwise simple subject, Meharg aspires to elevate objects to symbols. Meharg’s work is rendered with a focus on physical change over time, which may occur over many years or in a rapid moment, beckoning both an imagined past and an often-precarious future. https://www.facebook.com/stellersgalleryatpontevedra/. Visit the Instagram page at https://www.instagram.com/stellersgallerypontevedra/?hl=en. Visit the website at www.stellersgallery.com.